Awesome work, this is much appreciated! When I hit a link at it starts playing, usually a loud, unwanted advertisement, I have been clicking “close” on the page. You are doing content providers a service with this – now I might actually stay on their page instead of reflexively closing it. thank you! thank you! This is a much needed feature. Whatif we want to bring TV-like experience to our users where clicking a video each time becomes an annoyance? At least you can add some “allow autoplays from this site” option? We understand that there are valid use cases where users would want to autoplay. That’s why there is user interface where users can whitelist sites which they want to be able to autoplay. Part of the challenge of this feature is balancing annoyance mitigation with enabling genuine use cases. Please block ALL auto play audio, video, and GIF’s and use a play button to activate desired elements. Many websites now detect your bandwith and fill all of the pipe with crap A/V. Unfortunately, if we blocked inaudible videos as well, sites would work around this using web technologies like canvas or just show a sequence of images in order to approximate playing video in power draining ways. Although your logic is fine, it misses the point made by Tony D and others: Web developers forcing us to tolerate unwanted audio or video is at best deeply uncool, and probably not so ethical too. Focusing on the difficulty of blocking their efforts is valid and worthwhile if you want to tell us that the development will take time, but it’s not a good final response. There will always be an arms race between crapvertisers and browser developers. We get that. The fact that crapvertisers will try to come up with alternatives isn’t relevant. The fact that they clog the bandwidth and (at some future date) may use this channel to deliver malware is the point (did anyone say “Flash”?). Please reconsider, and provide an option for blocking *all* autoplay options. Sorry, it’s been shown that advertisers will find a way to get the effect of playing video if inaudible videos are blocked. If we followed the cat-and-mouse game to its conclusion, we’d end up having to disable all interactive bits of the web, and that seems like too steep a price to pay. How will ‘muted autoplaying videos’ impact screen reader users? We’ve run this past our accessibility experts, and it is acceptable to them. So far the user interface for adding sites to your personal whitelist of sites allowed to autoplay isn’t quite accessible yet, but we’re working on improving that. Media of any kind should not be allowed to autoplay period. It makes no difference if it is muted or not, audio only, video with audio, it should not autoplay. Unfortunately, if we blocked inaudible videos as well, sites would work around this using web technologies like canvas or just show a sequence of images in order to approximate playing video. These techniques are less power efficient than just playing inaudible video, so allowing inaudible video is the “least worse” option. Note: this is not a hypothetical concern; one of our competitors observed this when they shipped inaudible autoplay video blocking! I love Firefox but my hatred for videos that start automatically when I open a web page caused me to switch to Chrome several months ago. Chrome is not perfect at blocking videos, it’s just a little better than nothing. Thank you for fixing this problem in Firefox, I will definitely ditch google chrome when you release Firefox 66 this March. By default, yes. Like any other site, video on YouTube will not autoplay unless the page you’re viewing has had user interaction. 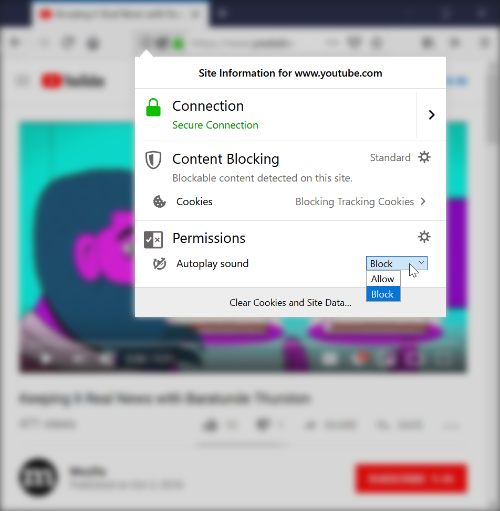 Users can add sites they trust to autoplay to their own whitelist by clicking on the “autoplay blocked icon” in the URL bar. This users can configure Firefox to allow YouTube (or any other site) to autoplay. I guess it’s too late, but please reconsider. I’ve seen artists say this is approach is so upsetting, it makes them want to remove their art from the internet. There’s got to be a less heavy-handed approach. I understand authors’ frustration, but our research indicates that the vast majority of users do not want audible autoplay. All major browsers are blocking autoplay now, so sites will need to adapt, and display a “start” or “unmute” button in order to work reliably across browsers. I don’t. What prevents artsits to prepare their art to start with an user interaction? It just has to be one click, right? A page needs a single interaction to unblock autoplay media on that page. Artists may need to add a “start” button to their work. I understand and am fully behind this implementation *in cases where I did not explicitly or implicitly ask to see a video. * But as a for instance, say a user is on a site and does a search which returns a list of available videos. They click a link that says “play” beside a video. This opens an overlay iframe with the video in it. Pretty standard for a lot of sites that host videos. Unless I’m misunderstanding the implementation, they’ll have to click the play button on the html player to watch the video even though they’ve already made an explicit request to play the video. Which means two clicks for each view. If you’re viewing more than 3 videos, this is going to get pretty annoying pretty fast. In your example, the click to open a video would count as interacting with the document, and thus unblock autoplay in that tab. So if the page then went on to open in iframe inside the document, the content in that iframe would be allowed to autoplay, as one of its ancestor documents (its parent) has had user interaction. This also works if the new document is cross origin (a lot of videos in child iframes are cross origin). However, if your page opens a new window in which to play the video, then that new window would not be considered to have had user interaction, and a new user gesture would be required before autoplay would work inside that window. Have no idea why it’s taken so long as this has been one of my top internet frustrations for quite some years now. Turning up your volume to watch one video because the sound is quiet and then suddenly having incredibly loud sound blast in your ear through your headphones as soon as you visit another site just makes me really angry and also shows no consideration for people’s auditory health. Thanks for working on great features like this! I am glad you are going to implement this! Hmm… I’m still not happy about this coming to firefox in general due to it’s negative effect on games (https://arstechnica.com/gaming/2018/05/chromes-autoplay-video-blocker-is-accidentally-killing-web-based-games/), but I guess the per-site option somewhat alleviates that, so thank you *very much* for including that! Will it be possible to disable the auto-sound-blocking by default? At this time we are planning on shipping audible autoplay blocked by default. Not everything on the web is a news site with ads. These paternalistic changes consistently ignore SaaS based multi-media web applications and keep making our jobs harder. If you must continue to “protect” us give our paying customers a way to opt out of these features for our site. Users can click on the “media blocked” icon in the URL bar to access UI to whitelist a site to allow it to autoplay. There’s a screenshot of the UI in the blog post above. There should be an opt-in solution to block ALL autoplay while auto blocking autoplay with sound is active by default. This should give US an opportunity to turn it off when needed and advertisers will not go crazy and workaround on this. You’ll be happy to hear that due to popular demand, we’re going to add a checkbox in our preferences menu which allows users to disable inaudible autoplay as well. This will be disabled by default. Thank you! This is exactly what I wanted to hear and what I believe is a great compromise as its disabled by default. Hopefully this has a sort of whitelist like the audible one, then it’s just perfect. Really, thank you for adding this. I have a question about the interaction part. Suppose that I’m on a social network website, where there is a feed, with videos, and many other things to click on. By default the autoplay would be off (thank you for the option for mute videos! ), but what happen when I click/interact on the page, for example clicking on “like”, “retweet”, play a single video, and so on? Will all videos from that point forward be able to autostart with the audio while I scroll down the feed? Yes, once you interact with the page, the page will be allowed to autoplay at will until you reload or close the page. If we required that video could only play inside a gesture handler, what could happen is inside your first interaction with the site, the site would create a bunch of hidden videos which were allowed to autoplay when it so desired. So the two behaviors are roughly equivalent, but one is a lot simpler for site authors. That said, if autoplay video continues to be a nuisance on the web, we may look at ways to do something like only allowing video to play inside a click handler. But anything we did there would have to be carefully thought through.